Someone asked about inventory levels. Inventory shrinkage continues fueled by the high number of sales and the lower than usual number of new listings. 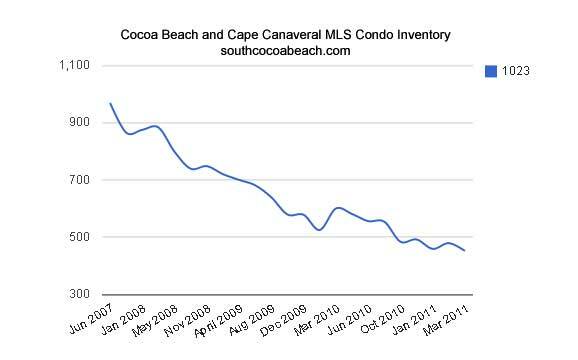 MLS condo and townhome inventory this morning in Cocoa Beach and Cape Canaveral is at 452 units, it's lowest point since I began tracking this number in May of 2006. That translates to just slightly more than a 10 month supply at current sales levels (most recent 4 month average). Is that a big deal? You decide. One year ago, March 2010, using the same formula (inventory over average sales rate) we had a twenty month supply. 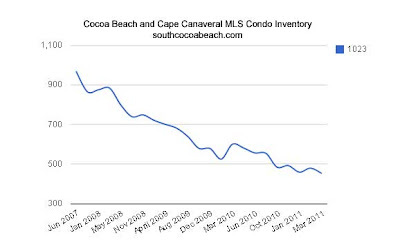 One year earlier, in March 2009, we had a whopping 35 month supply of condo inventory. Our supply has been cut by two thirds in two years. The effects are being felt. As has been the case for the last several years the inventory over burn rate number is higher for luxury units, more than double using the same formula as above but realistically even higher than that because of erratic closings and unlisted but available units in troubled complexes. With those fundamentals I think it's safe to expect to continue to see price erosion in the luxury segment. Lower supply and higher demand would seem to predict another scenario in the mid and lower price ranges.